What does this stylish-looking passive monitor controller offer that its competitors don’t? 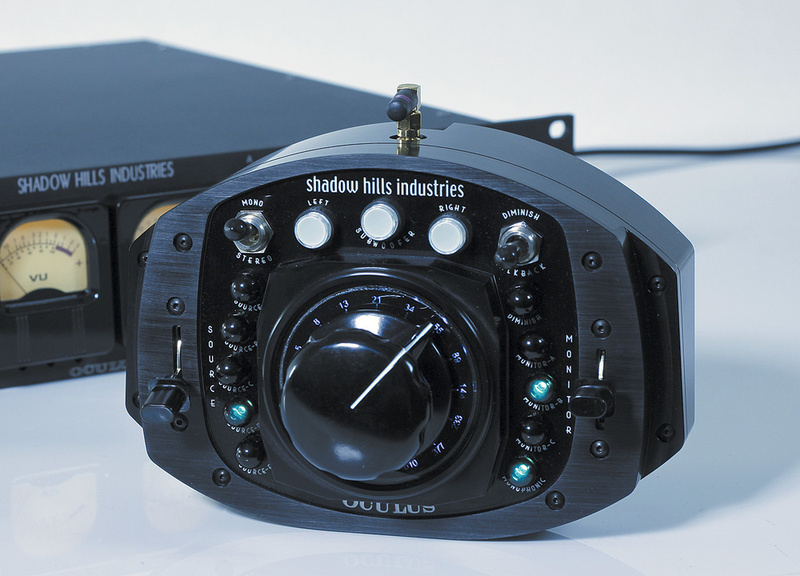 Behind the distinctive WWII styling, Shadow Hills’ products deliver serious, professional audio quality at a premium price. Their latest device, the Oculus, is a passive monitor controller based around relay-switched passive attenuators and is available in two versions, with either a wired or wireless remote control unit. 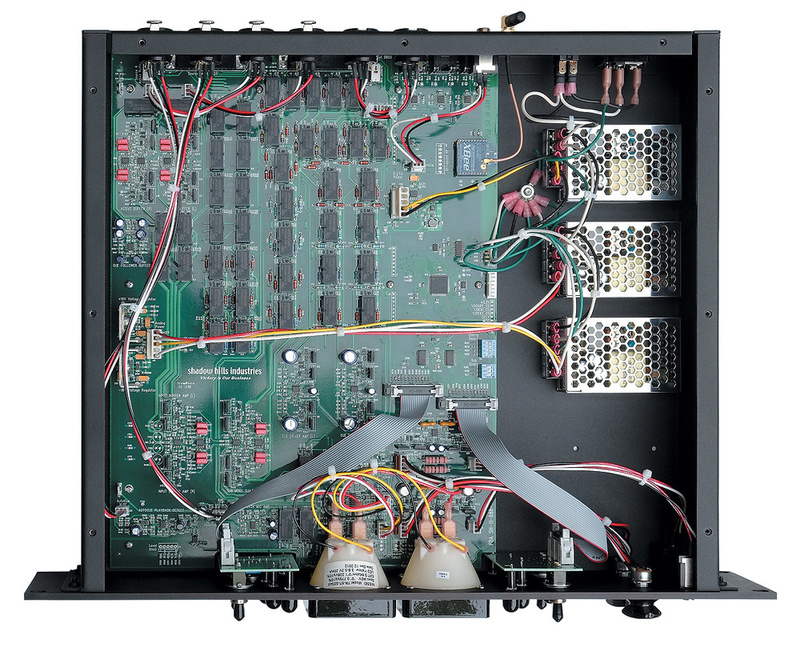 The main 2U rack chassis houses the I/O, audio circuitry, and some configuration switches, but most functions are controlled from a chunky remote control which Shadow Hills call a ‘Pendant’. The wired Pendant is connected via a standard (supplied) Cat 5e cable, while the wireless version (as reviewed) supplements this facility with a stubby aerial on the rear panel. A similar aerial is fitted to the rear of the rack unit, to allow fully wireless operation. Neither the hardware nor the handbook state the frequency of operation, but I presume it’s in the region used by DECT cordless phones. A universal wall-wart power supply (100-240 V AC) was included for charging the wireless Pendant’s internal Lithium-ion batteries, but it had a moulded US-style plug. Thankfully, for those of us not in the US, the wireless Pendant can also be charged via its Cat 5e connector from the main unit. Battery life is given as more than 24 hours, and a full charge takes under six. Five balanced stereo monitor inputs are provided, with input A on XLRs and inputs B to E via an AES.59 (Tascam-format) DB25 socket. The monitoring signal path is entirely passive, although an active buffer/gain stage can be switched in for input A (via a rear-panel push button) to accept an unbalanced stereo source and raise the level by around 6dB. The main frame has a built-in talkback mic, but an XLR accepts an external mic, if required (phantom power is not provided). Another rear-panel push button selects the internal or external mic, and a quarter-inch TS jack socket allows remote talkback activation by a footswitch or similar. One more XLR socket accepts an auto-cue signal, such as SMPTE timecode or a tone stripe. With the Auto-Cue function enabled (via a toggle switch on the rack unit’s front panel), talkback is automatically turned on whenever the auto-cue signal level falls below -12dBu, and is turned off again when the auto-cue signal exceeds that threshold. The idea is that the lines of communication between engineer and artist are opened automatically whenever the DAW or tape machine isn’t playing or recording. For some people this will be a huge benefit, but for others a potential nightmare situation, since there’s no obvious ‘Talkback On’ warning light! Talkback can also be operated manually, via a Diminish/Talkback toggle switch. With talkback engaged, the monitors are dimmed by default to reduce the risk of howlrounds and make it easier for the artist to hear any comments. However, this auto-dim function can be disabled using the TB-Diminish Enable toggle switch, which has a green indicator lamp below. The Talkback and Diminish functions are also available via the Pendant. An indicator illuminates when the monitor output is dimmed (which, unlike the talkback status, I’d have thought would be pretty obvious). On both the rack and pendant, the Talkback side of the toggle switch has a momentary action, while the Diminish side latches to provide a modest 10dB attenuation. 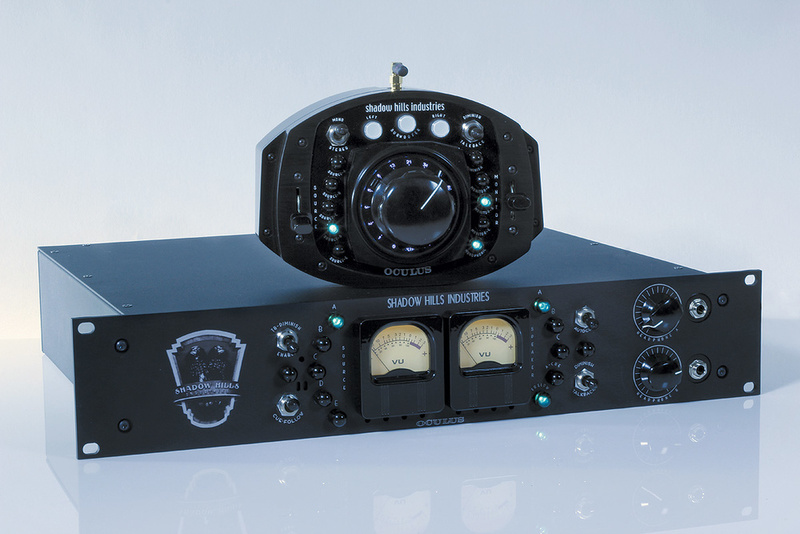 The rack unit includes provision for foot-switch operation of internal or external talkback mics.On the output side, the Oculus provides three balanced stereo monitoring outputs, plus a mono subwoofer output. Speaker A’s outputs are on XLRs again, while speaker outputs B, C and the mono subwoofer feed are provided on another AES.59 (Tascam) connector. The subwoofer’s output level can be set differently for each speaker selection, and manually muted from the Pendant. Also included in the AES.59 output socket is a stereo-balanced artist cue signal, and an unbalanced stereo feed for an external metering system. Level controls are provided for each output, via trimmers sited directly below the pair of vintage-style VU meters. The VU meters themselves are factory calibrated for 0VU = +4dBu and have trim controls, as do the external meter outputs, while the internal/external talkback mic gain is adjusted via another trimmer, found alongside the TB-Diminish toggle switch on the rack unit. The artist cue output is derived from Input E, but a Cue-Follow toggle switch on the rack unit sends the signal being auditioned on the main monitors instead. Two high-quality class-A headphone amplifiers, each with its own volume control and quarter-inch output socket on the rack panel, are provided for local artist cue and monitoring. Talkback is routed to both of these, and to the rear-panel cue outputs. An arc of five LEDs behind green bezels, on the left-hand side of the rack unit’s VU meters, indicates the monitor source selection (A-E), while a similar arc of lights on the right indicate the output selection (A-C), Auto-Cue mode, and Cue-Follow mode. The Pendant provides the only means to activate some of the Oculus’s facilities, and its surprising weight is largely due to it being machined from solid aluminium. A large Bakelite volume knob dominates the layout. It isn’t the rotary switch I’d expected, but a continuous potentiometer which sends a varying DC control voltage to activate the attenuator relays in the main unit. 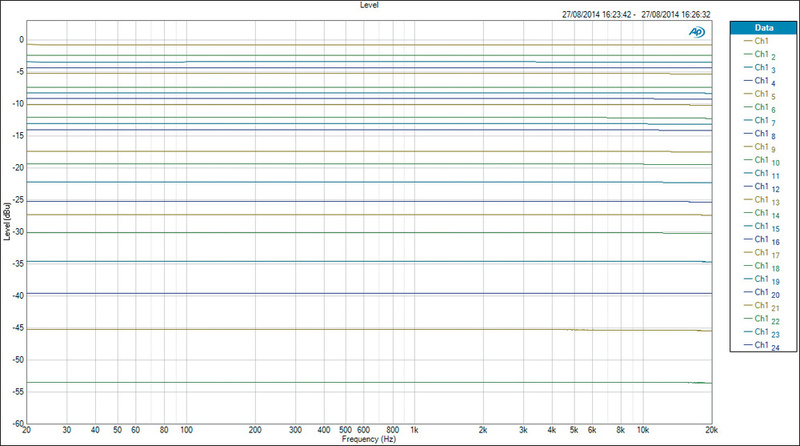 This chart shows 21 of the 22 relay-switched passive attenuation levels (the last being a full mute). The frequency response is clearly unaffected by the attenuation setting, and the attenuation increments can be readily appreciated.It’s good practice with a passive monitor controller to keep the remote control out of the signal path. In passive designs where the signal passes through the remote, cable capacitance and the impedance of the remote can cause a loss of audio quality. The nature of the DC control voltage arrangements here, though, means that the relationship between the knob position and the output level is a little vague, as the knob can rotate over several degrees before the audio level changes. This isn’t to say that recall is deficient — every time you set the knob to the same position you’ll get the exact same level. The illuminated scale around the volume control has only 15 marks for 22 attenuator levels (the scale reads 0, 1, 2, 3, 5, 8, 13, 21, 34, 55, 89, 144, 233, 377, and 610). So each numerical position is something like 1.618 times larger than the previous one, and I’ve no idea what that’s all about! The attenuation values were not as precisely spaced as I was expecting, but the first 12 are in roughly 1dB increments, expanding to 3dB over the next six, and then a couple of larger steps before a full mute. Pulling the main volume knob up also applies a full mute, and the volume scale lighting is dimmed as a visual indication. As with the main unit, an arc of five green lights indicates the monitor source, selected with a Fender-style five-way lever switch. A mono/stereo toggle switch is provided but, strangely, its status light is located far away in the bottom right-hand corner of the Pendant. 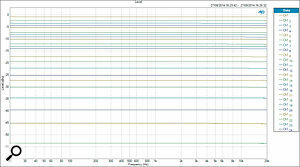 The mono summing is performed actively, with 6dB of attenuation to constrain the peak level. Five more green lights on the right indicate when Diminish is active, the output destination (selected with a three-way Fender lever switch), and the mono sum is selected. The top-right toggle switch provides the momentary talkback and latching Diminish functions. Three illuminated push-buttons sit above the volume knob and these mute the individual left, subwoofer and right speaker outputs using the relay attenuators, and so are placed before the mono-summing circuitry. Thus, muting one channel and selecting mono allows the other channel to feed both outputs, if desired. The Oculus is constructed to an excellent standard. Three separate OEM power modules supply the various analogue, digital, and relay power rails, and their reference earths are gathered at a star connection bolted directly to the metal chassis floor, along with the mains safety earth — would that other manufacturers were so fastidious! Most of the electronics are accommodated on a single PCB, with the active electronics constructed from a combination of surface-mount and conventional components. The active audio buffers and gain stages are mostly surface-mount NE5532 op amps working in concert with discrete output transistor pairs. 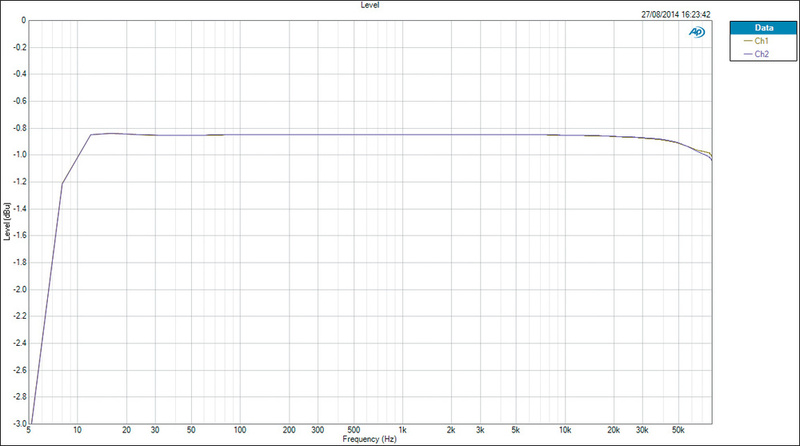 The overall frequency response on a very expanded amplitude scale. The response is flat within a fraction of a decibel between 15Hz and 40kHz.I ran a full set of bench tests with an Audio Precision system. The frequency response is claimed to be flat within 0.1dB between 1Hz and 100kHz, but my tests gave -1dB points at 10Hz and 80kHz, reaching -3dB at 5Hz (the -3dB HF roll-off was beyond the AP’s measuring limits). However, the THD+N figure was better than Shadow Hills’ published result, achieving an impressive 0.0004 percent and SMPTE intermodulation was 0.0006 percent. The headroom is theoretically unlimited in a passive system, but the active buffer option on Input A clips at +24dBu. 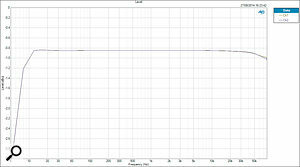 The outputs have the same signal polarity as the inputs, with a 10kHz crosstalk figure of an impressive -110dB. The noise floor is -114dBu (20Hz-20kHz, A-weighted) in passive mode, but a rather disappointing -82dBu with the Input A buffer engaged. The slim hardback handbook, designed to look like a vintage user manual, is full of sepia-toned photos, along with quasi-military information on how to destroy the product to evade enemy capture, and other similar frippery. Half the faux-aged pages are actually blank, but the technical information relating to operating the Oculus is generally clear and easy to read. Using the Pendant is straightforward and the controls all fall nicely to hand. The status lights aren’t as helpful as they could be, though, given that they’re all green and often physically disassociated with their corresponding switches. The lack of a ‘talkback-live’ light that I mentioned earlier may be an issue for some users, too. 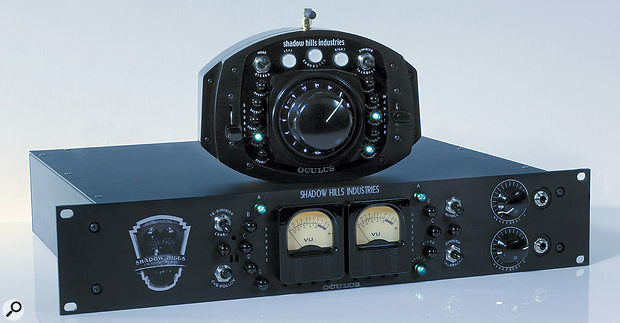 Shadow Hills’ marketing claims the Oculus is “the finest monitor console ever made the ultimate reference monitor controller”. Sadly, this is demonstrably untrue. It’s certainly well built, and performs very well for the most part, but it lacks some important functionality. For example, it’s not possible to audition the stereo difference (Side) signal, an essential function for checking the alignment of stereo mics and processors, as well as monitoring the damage inflicted by lossy codecs. Nor can the mono sum be auditioned on a single speaker, which is vital for checking the balance and tonality (a phantom mono signal has a totally different bass response). A shot of the internals of the main frame. Three SMPS power modules occupy the right-hand side, with a star-grounding point immediately in front. The numerous black objects occupying the top centre of the main PCB are the sealed relays — three separate passive attenuator chains are provided for the left, right and sub-woofer outputs. 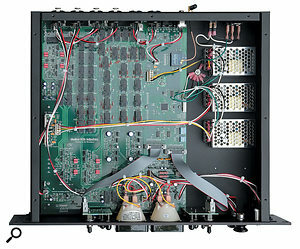 The auto-cue signal detector, talkback preamp, VU drivers and headphone amps are hosted along the bottom edge of the PCB (from left to right), with the input buffers, mono summer, and Cue signal drivers between them and the relay chains. The wireless ‘Pendant’ remote control unit can be recharged while connected to the main rack unit via a CAT 5e cable.More significantly, it’s not possible to adjust the relative input levels of different sources to enable accurate A/B comparisons — something which is surely fundamental in a ‘reference’ monitor controller. Plenty of products from other manufacturers do include these functions (and more), most for considerably less outlay, too. For example, the Oculus offers essentially the same functionality and passive signal path as the PreSonus Central Station, whose price is a fraction of that of the Oculus. OK, so that product doesn’t have relay-switched attenuators, and the audio quality can suffer slightly when the wired remote is used, but otherwise, in both practical and audio-quality terms, there really isn’t that much to choose between them. The (active) Drawmer MC2.1 is similarly priced to the PreSonus, boasts superb technical performance, the same core functionality and more versatile monitoring facilities. Comparing the Oculus with high-end monitor controllers, the Crane Song Avocet, Dangerous Music Monitor ST, and Crookwood C3-8AS all still cost less but offer similar functionality, superb audio quality, are significantly more capable in many respects, and all are also expandable. That’s not to say that the Oculus does what it does badly, though. In fact, in a straight comparison with my reference Crookwood M1 mastering console/monitor controller, I must say the Oculus performed very well indeed, and to all intents and purposes it sounded like a straight cable-connection at all attenuator settings. There is no discernible coloration, and the sound quality doesn’t vary with input or attenuation levels — although activating the input A buffer results in a perceptible rise in the noise floor. The cue monitoring system also performs well, with plenty of headphone level available and clear, intelligible talkback, and the inclusion of balanced line-level stereo cue signals on the outputs’ AES.59 (Tascam) connector makes it easy to interface the Oculus with an external headphone amp. Employing a standard Cat 5e cable for the wired Pendant is simple and effective, while the wireless option will appeal to many and has a remarkable range — I discovered I could operate the base unit from anywhere in the house and half way down the garden! From a technical standpoint, the Oculus is an impressive performer in most respects, and the styling, the audio quality and wireless remote control will hold appeal for some. Yet it lacks some operational facilities that I consider to be essential for a monitor controller at this asking price, and which are offered by much more affordable products with no sacrifice in the audio quality. The Dangerous Music Monitor ST, Crane Song Avocet and Crookwood C3-8AS all employ relay-switched passive attenuators, all include a full range of monitoring facilities including the ability to match source levels, are all expandable, and all cost less than the Oculus. The first two also provide a high-quality D-A converter and accept both analogue and digital inputs, while the third can be expanded to add that functionality (and much more) if required. Considerably less expensive options, but with similar quality and features, include the Coleman M3PH, PreSonus Central Station, and Drawmer MC2.1. Wired or wireless remote control. Lacks too many essential monitoring functions. No facility to balance input levels for accurate A-B comparison. The Oculus is a stylish monitor controller, with a clean signal path, courtesy of the relay-switched passive attenuators, and talkback to dual cue headphone outputs. Its funky remote control panel is available in both wired and wireless versions. Unfortunately, it’s rather expensive and lacks some important facilities. Without wireless remote £2400. With wireless remote £2499. Prices include VAT.